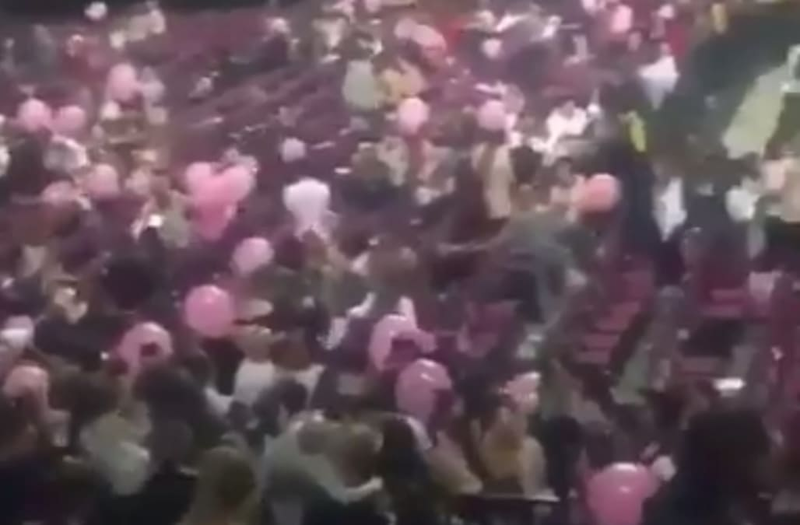 Footage has emerged from inside the arena capturing chaos in the wake of an explosion at the end of an Ariana Grande concert in Manchester, England on Monday night. A video shows attendees running for the exits after the explosion, which officials suspect might be the work of a suicide bomber, according to NBC News. British law enforcement officials confirmed Tuesday morning local time that the explosion was being treated as a possible terrorist attack. At least 19 were dead according to initial reports, but officials cautioned that number might rise. Another 50 had been injured in the explosion. A separate video captured shrieks of frightened concert goers and travelers at Victoria Station, which abuts the Manchester Arena where Grande had performed. Some witnesses at the concert suspected that a nail bomb might be responsible for the attack. Gary Walker, who was with his wife a short distance from the explosion waiting for their daughters to emerge, told BBC there was "a massive flash and then a bang and smoke." He reported a "hole" in his foot containing shrapnel, and said his wife has "a stomach wound and possible a broken leg." Another witness told BBC reporters there were "bodies everywhere" after the explosion. Representatives for Grande, who had finished her performances shortly before the explosion occurred, confirmed that she was safe after the incident. The arena holds approximately 18,000 at capacity, but it was unclear if the concert had been sold out.